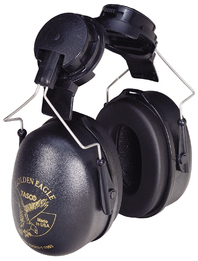 Tasco Golden Eagle hard hat model ear muffs bring the benefits of the Golden Eagle to hard hat wearers. Rugged construction with wire form arms and tough plastic components makes these ear muffs extra durable, and Tasco's Soft-Seal™ ear cup cushions ensure superior comfort. Fits all major slotted hard hats. Available in two colors: Black and High Viz Green.